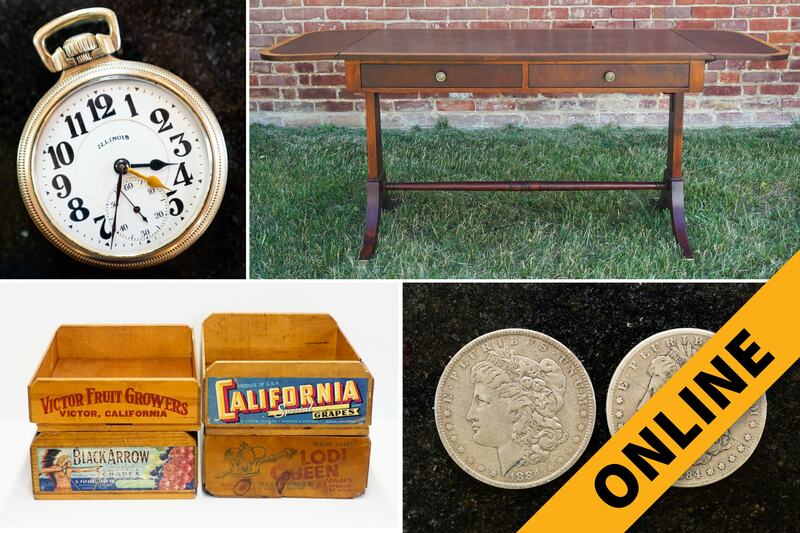 Vintage & Antique Online Auction — Harritt Group, Inc. Selling the private collection of Carmen & Gordon Carter from their Indian Hills, Louisville, KY home including vintage, retro & decorated furniture, silver coins, pocket watch, costume jewelry, decorative arts, antiques, collectibles & artworks. Mahogany Regency drop leaf writing desk, Birdseye maple butler’s chest from Bensingers, Louisville Ky, walnut gentleman’s chest, ladies French style vanity, French style kidney shaped desk, Victorian walnut chest, Birdseye maple secretary desk & chair, Federal style drop leaf table, art deco porcelain top kitchen table & (2) Hitchcock chairs, vintage serpentine chest, empire library table, birch corner table, maple library table, kitchen island, pair of contemporary accent tables, French provincial side tables, painted tea table, 1920’s women decoupage table, oak painted Queen Anne side table, apothecary cherry end table, assorted accent tables, antique cherry drop leaf table, wicker & iron table and (4) chairs, (4) Hitchcock style dining chairs, assorted side chairs, plant stands, iron bakers rack, (4) Bentwood chairs, modern corner curio table, iron plant stands and more. Illinois GMT multi-time zone 10K gold filled 21 jewel pocket watch with dome display. (16) Morgan silver dollars 1884-1921, (7) Peace silver dollars 1922-1923, (8) 1940’s Walking Liberty silver half dollars, (2) Ben Franklin silver half dollars 1953 & 1962, (5) 1964 JFK silver half dollars, (14) JFK 40% silver half dollars 1965-1967, (12) JFK 40% silver half dollars 1968-1969, (5) silver dimes, (15) Eisenhower silver dollars 1971-1976, Buffalo nickels, Indian heat, wheat & steel pennies, (4) $2 bills & foreign coins. Large selection of Jewel Tea Autumn Leaf china selling as one lot including dinner plates, salad plates, flat soup bowls, fruit bowls, cups & saucers, cream & sugar, casserole, platter, stacking canister set, tidbit tray, gravy boat, tea & coffee pots, pitcher, S&P shaker, frosted tumblers & tablecloths, (72) pieces of Johnson Brother The Vigo Ribbed Old English china, (8) porcelain door knob handles, vintage postcards, James Whitcomb Riley books, children’s books & records, vintage books, Christmas decor, wood fruit box, (2) Empoli Italian amber decanters, candlestick collection, Bluegrass Hardware ads, oil lamps, industrial wood tray, chandeliers, linens, decorative boxes, serving trays, bookends, hammered aluminum trays, figurines & statues, sewing goods, child’s toy sprinkling can, vintage paper goods, sheet music, large selection of floral, European & local prints, selection of decorative wall mirrors, iron easel, vintage kitchen wares, blown glass water buoy, blue jar, vintage oak file box, Denmark silverplate comb & mirror set, child’s wicker rocker, wood garden tool caddy, vintage luggage & rack, baskets, vintage ladies wrist watches including Gruen, Waltham, Towncraft & Banner, sterling cross, Weiss brooch & earrings, large selection of ladies costume jewelry including brooches, earrings, pearls, frosted glass necklaces, decorative beads and more.